The UK government is failing to get its position over Gaza across to British Muslims, a cabinet minister has said. Communities Secretary Hazel Blears told the BBC the UK faced a "worrying time" amid fears that the war was radicalising some young people. She said the UK had supported the UN call for a ceasefire and had urged Israel to let more aid into Gaza. "But I think that [position] isn't necessarily getting across in the way that I'd like to see," she continued. Ms Blears said ministers needed to make sure that people "don't feel that there's hypocrisy and double standards". She told the Straight Talk programme that the government understood Muslim anger over Gaza. They say ministers have not done enough to explain the UK's position and to help communities sideline jihadist recruiters. Top-level Whitehall meetings have been reviewing the government's preventing extremism strategy, with officials concerned that hard-won gains could be rocked by the crisis. "I think we are at quite a difficult time and it's very worrying," Ms Blears minister said. She said tensions "inevitably have arisen, particularly with Muslim young people... because they are idealistic". She said: "They are angry… at some of the things that are going on in Gaza and the pictures that they are seeing. "We understand the anger. But my concern is that that anger doesn't have to lead to radicalisation, but it provides some fertile ground for the people who want to peddle the messages of violent extremism to draw our young people in further. "I think now we've got to redouble our efforts to get the government's message across." Ms Blears said the UK has called Israel's bombings "disproportionate", but added: "We're not all brilliant at [expressing this] and I think we have to really, really try now to explain that so that people don't feel that there's hypocrisy and double standards." Senior ministers have held a string of meetings with Muslim communities in a bid to address rising anger. Muslim leaders said the government was struggling to win hearts and minds over Gaza. Community cohesion minister Sadiq Khan has now written an article for an influential Pakistani newspaper which is widely read in the UK. In the article, Mr Khan says the UK deplores the violence and suffering. But he adds: "These events have real repercussions in the UK. Feelings are running high in many British communities. "There are some who will exploit and distort the horrific events in Gaza to radicalise British Muslims. Already in towns across the country they are trying to further their own objectives on the back of others' misery. "They misrepresent the British government's position: they conveniently obscure the facts - such as the fact that some Palestinians are Christians - where they don't fit their political ideology. "Now more than ever it is vital that communities stand together to condemn these callous opportunists." Some 20 clerics and thinkers distributed a letter to mosques on Friday calling for British Muslims and Jews to stand together, after figures showed a record rise in anti-Semitic incidents. 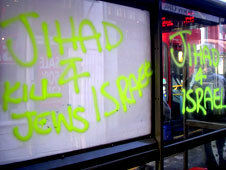 Some Muslim leaders have reported extremism messages and posters in parts of London and other cities. In a Commons debate on the conflict this week, Foreign Office minister Bill Rammell said the government recognised Israel's right to self defence but the response to Hamas rocket attacks was "disproportionate". He added that Israel's action was an indictment of the "international community's failure over years and decades... to bring about a two-state solution".